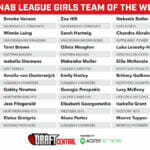 A COMPREHENSIVE win to the Northern Knights in Round 1 of the NAB League Girls competition has resulted in them receiving the most nominees in the Draft Central Team of the Week. 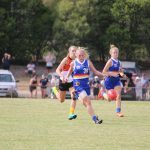 The Knights had four players named in the 24-player squad, one more than Oakleigh Chargers, with eight of the 12 sides having two players, while Gippsland Power had one, and Murray Bushrangers just missed out on a player following the heavier defeat. 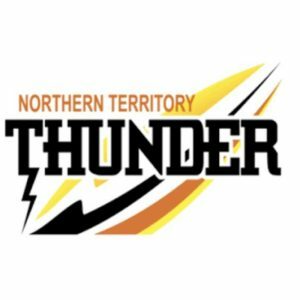 Northern’s 76-point victory over Murray saw equal round-high leading goalkicker, Britney Gutknecht slot into a forward pocket with Ellie McKenzie at half-forward having spent time between midfield and attack. 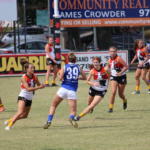 Gabby Newton played all over the ground, but spent some time in the ruck and therefore was named there, while Jess Fitzgerald was also impressive and earned a spot on the bench. 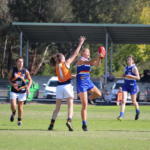 Oakleigh’s attacking duo of Emily Harley (four goals) and Amelia van Oosterwijck (two) earned their places in the forward line, while speedster Alana Porter also made the team for her performance. The defensive end is mostly comprised of Stingrays and Dragons, and while both sides lost, Zoe Hill and Sarah Hartwig hold down the key defensive posts, while Brooke Vernon and Winnie Laing provide the run. 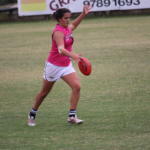 Laing spent more time in the midfield, but can play in defence, similar to Gippsland’s sole nominee, Chandra Abrahams who played through the midfield, but has the capacity to play in defence and earned her spot in the team. 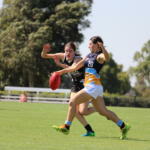 Greater Western Victoria (GWV) defender, Nekaela Butler rounded out the starting back six, joined in the team by forward, Isabella Simmons. The final forward in the starting side was Calder Cannons’ Makeisha Muller who looked lively throughout the match up forward, joined in the side by bottom-age prospect, Georgie Prespakis. 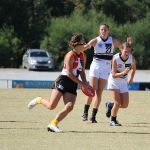 Geelong Falcons and Eastern Ranges make up the rest of the midfield, with Falcons captain, Lucy McEvoy and their best on the day, Luka Lesosky-Hay both in the side with Ranges’ Tahni Brown and Olivia Meagher. On the bench are two Pioneers and Jets who, while they did not pick up the four points, earned their places in our team. Eloise Gretgrix and Maeve Tupper represented the Pioneers in the side, while Isabella Grant and Elisabeth Georgostathis stood out for the Jets.